CONTEST: Win IMAX Windsor Movie Tickets! This article is 2832 days old. 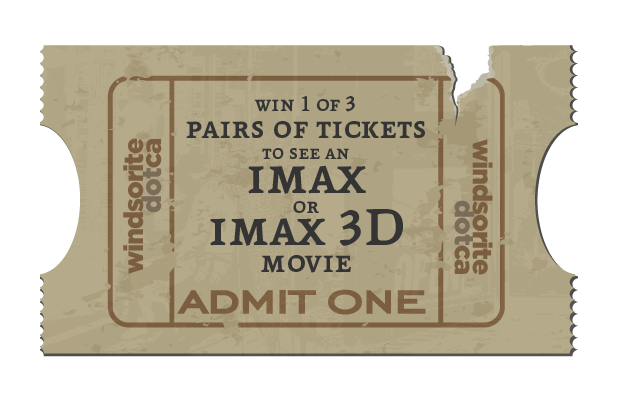 Want to win a pair of tickets to see an IMAX or IMAX 3D movie at Windsor’s Silver City? windsoriteDOTca will be giving away three pairs of tickets on twitter this Monday afternoon! Check your twitter account at 3:15, 5:15 and 7:15pm, reply correctly to our movie trivia and the first correct reply wins! if you’re a winner, we’ll not only contact you, but retweet your moment of glory!